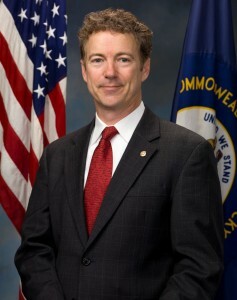 US Sen. Rand Paul is scheduled to be in Vanceburg Thursday for a Town Hall meeting. Lewis County Republican Party Chair Ben Harrison said Paul will be in Vanceburg at the former location of Kenny’s Restaurant on Second Street beginning at 11:30 a.m. The event was originally slated to be on Main Street. Tickets for the event are available at randpaul.com. Harrison said while tickets aren’t required they are recommended and are free. Organizers will have a better idea of how many people will be attending and will plan the event accordingly. Paul is scheduled to be in Maysville Thursday beginning at 9:30 a.m. at the Maysville Rotary Club Building and will travel to Vanceburg from there, Harrison said. Paul, a Republican, is running for reelection to the US Senate. Lexington Mayor Jim Gray is Paul’s Democratic challenger in the race. The Lewis County Town Hall event is expected to last about an hour. The Vanceburg location is at the blue house across the street from the Lewis County Extension Office.